India vs England live streaming online for free continues with Star Sports, ESPN and Star Cricket as we now move on the cricket stadium situated in picturesque Dharamsala. This time we have added a photo to let you know how beautiful is the natural scenery that surrounds this stadium. 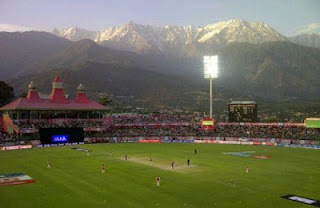 Exciting cricket surrounded by natural beauty is double treat for the cricket fans. India has already clinched the series and this match is mere formality for them. But being professional crickets none of the players would take this match lightly. England would seek a win here as a consolation before the fly back home. Rohit Sharma who was under a scanner after is disappointing performances recently, scored 83 runs which played a vital role in India's win at Chandigarh. Suresh Raina was another star who scored well after Sharma departed and guided the home team to a comprehensive win. India chased a target of 258 pretty easily. With the series result already decide we can expect both the teams experimenting with the playing elevens. Gautam Gambhir hasn't been in a sparkling form in past one year or so. Hence this serves a brilliant opportunity for Dhoni to replace him with an inform batsman like Cheteshwar Pujara. Who knows he may click well and be a good prospect for the next World Cup. As Rohit Sharma's opening performance has brought back him in the lime light he may get one more opportunity to gain some consistence. Virat Kohli will play one down followed by the regular middle and lower middle order for India which consists of Yuvraj, Raina, Dhoni, etc. Considering the new rules, Dhoni was always wary of an allrounder's absence in the team. If not perfect but Ravindra Jadeja has played a very good role of an allrounder in the team. He has contributed equally well with his bat and ball. Dhoni can now breathe a sigh of relief and concentrate on team's preparation for test series against Australia. England would most probably play with the same eleven. The visitors are getting good starts but all they need is to carry on and build a good score on it. They would strive hard to win here at Dharamsala and go home on a winning note. Catch all live cricket streaming updates with us.